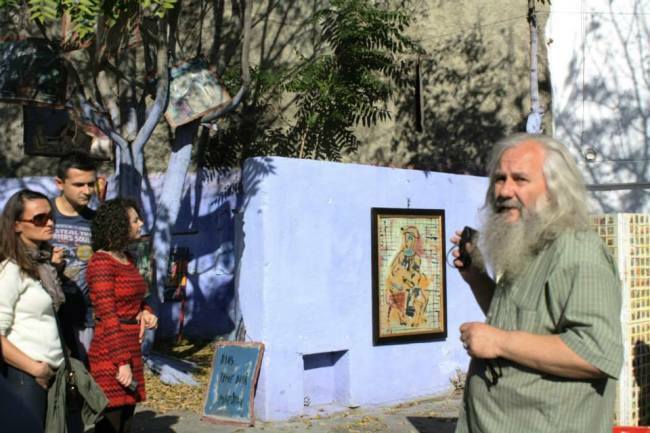 Art in Bucharest is a project we’ve started in 2011, including walking tours in which Bucharest artists’ studios are visited. 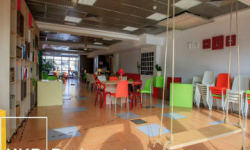 The participants to the tour, foreign and Romanian tourists, are discovering a completely new world of the urban space, are meeting Romanian talented and very hospitable artists and even buying straight from their studios the valuable art objects, for a better price than in any art gallery. The tours take place on Saturdays; they are walking tours and include touristic guidance on the streets with important architectural, historical and cultural potential in Bucharest. The idea came after we’ve participated to the White Night of the Artists’ Studios in Bucharest and we’ve decided that such encounters with the artists, right in their studios, should happen more often and should also be accessible to the foreign tourists. We are a small team of three and we manage the artists’ involvement in the project, the tours promotion and we are also the guides for these tours. How can somebody join you in this tour? The tourists interested in meeting new Bucharest artists by joining us can find more about our tours on our Facebook page or on our website. What is the number of the tourists joining you by far and what were their reactions? We reached our 22nd tour and over 250 participants from Romania, Canada, United States, Spain, Germany, France. The tourists are very curious, interested in the way the artists are working, how they are getting inspired, in how are they as persons, what are their interests etc. It is very nice to work with people that are really interested, so these tours are an exhaustless source of questions for the artists and an occasion to present themselves in front of some authentic art lovers. Each time we are inviting the tour participants to talk about their experience, about what they liked. Who are the artists you promote through your project? The artists in our tours are persons open to welcome us in their studios or even in their homes, generous as they share with us the emotion they feel when they create. 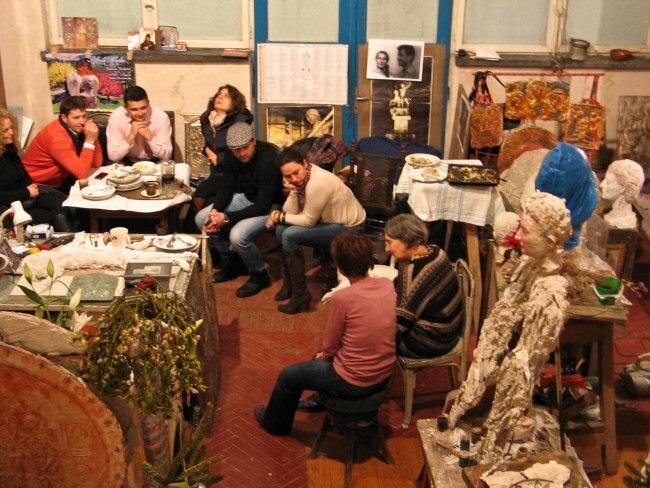 What happens during the visit to an artist studio? Are there any workshops included too? The artists in our Bucharest tours are part of various art fields: visual arts (painting, sculpture, ceramics, film, photography), decorative arts (tapestry), applied arts (crafts, hand-made, gastronomy), musical arts (piano, violin, cello). The artist invites us to his/her Bucharest studio in order to know him/her through his completed or on-going art works, tells us the story of some of the works, offers us a tea and the possibility to know him/her as an artist and as a person too. Each studio and each artist are different (a studio can be packed with colours and paint, for instance) – even when we visit the same artist in different tours, sometimes the artist is different from oneself. It is a pleasure to see him/her again, to find out what sources of inspiration he/she founded again, what is he/she thinking or feeling. 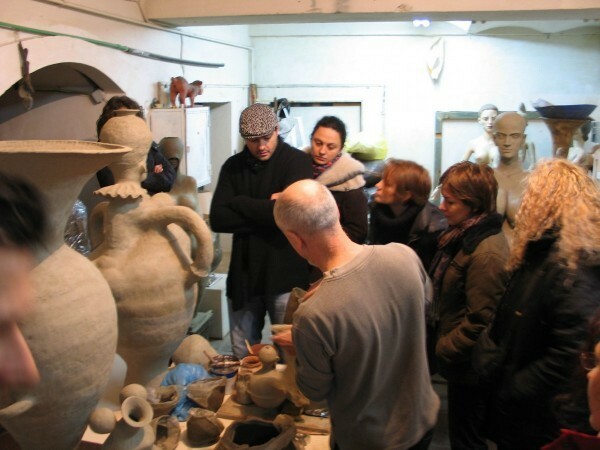 Apart the visits we also organize different workshops, for instance the pottery and Plastic handcarving workshop in Piscu, an ancient potters’ village near Bucharest. What are the museums you are including in your Bucharest guided tour? We have focused by now on presenting the artists in their studios, amidst their artworks, paint brushes and colours, in the creation space. However we also met the artists in the exhibit spaces where they have art shows. For instance, we were at the National Museum of Contemporary Art where we met Ioana Ciocan and we have seen her artwork in the “Good girls” show, at Aiurart where we met Marius Purice, at ART Hub, to see the show of Valentin Soare and also meet him. 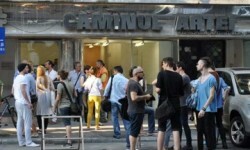 For our next tours, we will also visit the art shows at MNAC Annex and Atelier 30202. 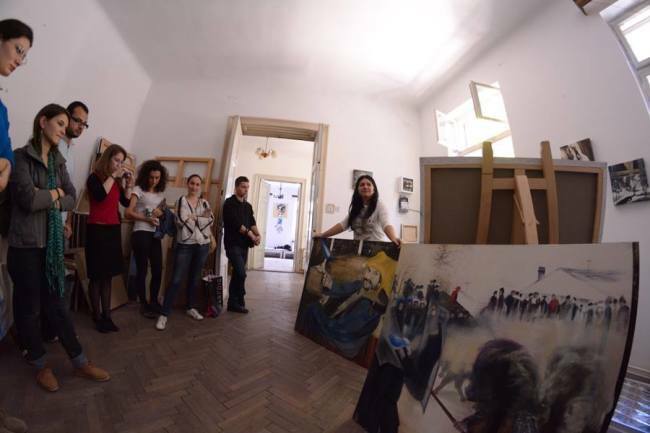 What we make different when taking the Art in Bucharest tour in museums and galleries is that we are also inviting the artist to talk to us about his/her works and about him/her. We will always try also to meet the person behind the artworks as he/she is the best person to make us understand his/her art and the process it came to life. What are the places the artists are usually frequenting outside their studios? 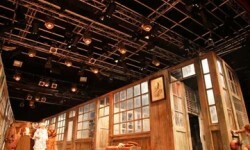 Have you also included such places in your tours? The artists are everywhere, from cafes to theatres and bookstores. I don’t believe there is an artists’ place anymore, as it used to be, although it would be nice to know you could meet the artists at a new “Casa Capsa” (former meeting places of the artists, in between-wars period). What I like very much about the artists in our tours is that they are extremely generous people telling us each time to pay them a visit over a cup of coffee when we are close to their studios, to tell each other latest stories. So, even if there is no artists’ meeting place, their studio door is always open. What are the most interesting cultural, artistic aspects of Bucharest? The city of Bucharest is interesting when you look carefully. Since we’ve started these tours, I see Bucharest through different eyes. I’ve learned that every little street had its history that I had never thought about, behind some apparently insignificant or shabby doors there were very interesting people and also found out that the centre of Bucharest hosts much more artists’ studios than we had ever imagined.